Pawn Kings owner is Adam Valenti who was ironically, a former correctional officer at a jail in west Toronto before he ran into legal troubles. Pawn Kings is the first pawn shop listing on the Canadian web presence directory LocalHood.ca. A LocalHood.ca advertiser gets a boost in web traffic through exposure on a Canadian reality show. The advertiser is a local pawn shop in Brampton, Ontario that operates under the name Pawn Kings Inc. The pawn shop owner was a featured contestant on an eight-part reality show that recently aired nationally on CBC television in Canada called Redemption Inc. The reality show followed the storylines of 10 ex-offenders who were given the opportunity of a lifetime; a chance to establish their own business under the guidance and financing of multi-millionaire businessman Kevin O’Leary. O'Leary is also a headliner on the CBCs' Dragons Den and ABC televisions' Shark Tank. Pawn Kings owner is Adam Valenti who was ironically, a former correctional officer at a jail in west Toronto before he ran into legal troubles. Pawn Kings is the first Pawn Shop listing on the Canadian web presence directory LocalHood.ca. LocalHood.ca is presently in beta release and only adding new advertisers on a selective basis. The television exposure led to a surge in referral traffic to LocalHood.ca from web visitors searching Google and Bing using key word search phrases like "Brampton pawn shop" and "pawn shops in Brampton". Web traffic to the Pawn Kings listing on LocalHood.ca through Google is an encouraging example of how a LocalHood.ca listing helps with online discoverability. The local business gained publicity through television exposure for the pawn shops' owner and people turned to the web to learn more. The beta release directory was there to capture visitors who could get all the core contact info for the pawn shop such as a map to its location, a link to its company website and its phone number. LocalHood Marketing has also helped the Pawn Shop with its website, a mobile website and is presently setting up a fan page for the business on Facebook. Similarly, Pawn Kings Inc. has helped LocalHood.ca establish a category on the directory that generates a proven local web presence for pawn shops. About his appearance on Redemption Inc. “It’s like winning the lottery in a way." said Valenti of the show. It’s an opportunity that not many people have and I'm looking more at the future of Pawn Kings and the publicity has helped". 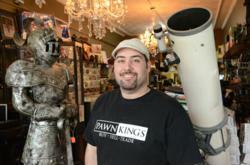 Pawn Kings is located at 48 Main St. N. in Downtown Brampton and Valenti hopes to open more locations in the future. Locations that will get listed on LocalHood.ca.